Rapid economic growth in China has attracted the attention of international luxury brand names, including French yacht maker Beneteau, which is betting big that the mainland will become its most important market in the long term. "Today we are building the market from the top [down]. 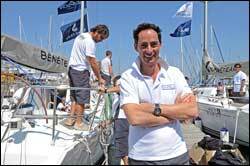 China can become one of the most important markets one day when the middle-class is interested in sailing," Beneteau Lagoon China manager Francois Rodrigues said. "But there is a long way to go," he conceded, noting that the 43 percent tax on imported boats will make it difficult for a sailing culture to reach mass popularity. "High-class customers are quality and brand-oriented and the middle-class will be more price-oriented – they don’t care so much where the boat is built," he said. To that end, Beneteau is considering launching a new series of boats that are more affordable but may not be made in France. The long-term solution is to have mixed production "like all the big international brands," Rodrigues said. As an example, he cites the carmaker BMW, which manufactures some of its models in Germany and some in China. The French boat builder currently has eight dealers on the mainland – the largest dealership network in its global market – including Hong Kong, Dalian, Qingdao, Wuxi, Xiamen, Shenzhen, Sanya and Shanghai, where the company also set up its Asia head office. e have 80 dealers. It is more important to educate the market step by step," Rodrigues said. "Buying boats and yachts is not like buying a washing machine or an automobile here. It takes time to establish a culture of sailing because it is a new hobby and lifestyle for Chinese people," he said. In the past three years Beneteau has sold 100 yachts in China, with sales boosted after the Olympic Games regatta in Qingdao that helped focus the attention of Chinese consumers on the sport of sailing. But with the exception of the Qingdao Olympic Sailing Centre, which Rodrigues described as an "exceptional example," there are few public marinas in China. More often they are part of a private real estate development, he said. Beneteau has been operating in the Asia market for a number of years already, including Japan, Korea, Singapore and Hong Kong, but "China is a new market that is very important and with a lot of potential," Rodrigues said. "The China market is still a baby now." The 100 boats sold in China over three years compares little with Beneteau’s total annual production of about 5,000 boats. Despite the long tradition of sailing and more marinas in Hong Kong, the SAR market is limited by the lack of sailing berths. Last year, the firm sold 53 boats worth more than 10 million euros (HK$105.4 million) each in Hong Kong. With its 125-year history, Beneteau has witnessed the rise of sailing culture in Europe and the US, where yachting took 50 years to become popular, while in Hong Kong and Singapore, the markets have been developing for 25 years or so. The Japan market is a good barometer for China. "The sailing market [in Japan] started 30 years ago and it began to mature after 15 years," Rodrigues said, adding that the market is expected to develop faster in China. "Everything in China is faster than everywhere else today. In 2015, the picture will be totally different in China," he said. "We want to make sailing popular." There is no significant difference between the developed markets in Europe and the developing one in China in terms of customer preferences, except for some minor requirements like sunscreen protection because most Chinese women don’t like to get sun tanned, according to Rodrigues, who was surprised to see Chinese people attracted to sailing. "Many of them are young business owners. They are healthy and sporty, aged between 30 to 45 years," he said. However, it is not yet popular for mainlanders to spend extended holiday time on boats. So subsequently, most boat owners usually take day trips that don’t require overnight accommodations. Starting in 2007, Beneteau signed up to sponsor the China Cup International Regatta, the first sailing boat regatta in Shenzhen initiated by local organizers and approved by the General Administration of Sport of China. As part of the sponsorship deal – which Rodrigues declined to put a dollar value on – the company provided 30 specially designed boats as well as the logistics and transport requirements for the vessels. "We can promote our brand through the China Cup, not only in China. The event is also held in other markets in the region because it is organized successfully,"he said. The annual event attracted 80 boats with sailors from 30 countries including France, the UK, US, Turkey and Israel. Beneteau boats are divided into two categories – motor boats and sailing yachts – and Beneteau commands about a 50 percent market share in sailing yachts in China. However, the motor boat market is fragmented, according to Rodrigues. The global boating market has not yet fully recovered from the financial tsunami in 2008, when sales slumped 50 percent. "We hope the market can rebound to the [same] level before the crisis by next year," said Rodrigues. "2009 was a good year for everyone in that the whole market went up 20 percent and this year the growth is expected to be about the same." The appreciating euro, which cools global buyer sentiment for European made products, may partly offset the robust economic growth this year, he added. However, growth in China was not affected by the global downturn because of the low installed base of boats on the mainland and the fact the market is still developing there. Rodrigues took up his position two years ago and he is the only foreign national in the 120-strong team of Beneteau staff in China. The company also organizes training for staff so they can acquire sailing expertise and develop the necessary after-sales service skills. There are approximately 80,000 Beneteau yachts sailing in the world, and the brand also owns one-third of the global boating market.